Digging the right hole is a critical step to gardening. You don’t want to suffocate the roots or hinder the plant’s growth with shallow or too small holes. In the same vein, garden beds produce excellent results in deep holes. Digging is a gardening chore so make sure you’re equipped with the right digging tools. Dig a test hole first to see what kind of soil you’re dealing with. If the test hole proved to be challenging, you’ll need more than just a spade or a shovel if you want to operate with ease. A spade is definitely one of the most typical gardening tools that you will use. The spade that is being shown off here is perfect for digging small holes that can go quite deep. You’re going to want to be able to do this when you are planting bulbs in your gardens. 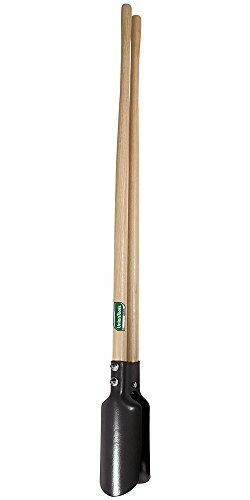 A spade like this is definitely going to be useful for many other gardening activities, as well, so you’ll want to own one or several of these, depending on your needs. Having access to a high-quality spade will always make your life a bit simpler as a gardener. You need to be able to dig in specific spots, and your normal shovel isn’t always going to be the right tool for the job. A spade with a long handle like this will allow you to work while standing up. You can still dig the smaller holes, but you won’t have to get on your knees to do so. Some people do prefer using the smaller hand shovels or hand spades for these tasks, though. It really is going to come down to personal preference. Sometimes people don’t want to get on the ground because they have trouble getting back up. In this situation, a spade like this is going to be the optimal choice. A gardening fork is going to be used to aerate the soil in your gardens. A tool like this is going to be very handy when your soil is very rocky or hard. You need to be able to bust it up and find ways to enrich it. Simply turning it over with your gardening fork will help to transform the soil into something that is more viable for growing plants. You will want to use a gardening fork on normal gardening areas every so often. Aerating soil is an important step that should not be neglected. When you want to have success in your garden area, it’s important to ensure that your plants have the nutrients that they need. Quality soil is necessary for plants to thrive, and your gardening fork will allow you to condition your soil properly. Using this tool is incredibly simple, as you will just be raking it across the top of the soil. You can dig into the soil with the tines of your fork and turn it over. Some gardening forks are small and are meant to be used while sitting down or on your knees. This particularly gardening fork is a longer version and can be used comfortably while standing up. A gardening fork like this is going to be a good solution for aerating the soil in a larger garden area. You’ll be able to maintain a comfortable position while doing your work. The gardening fork itself is durable and has a strong hardwood handle. Gripping it still feels comfortable, so you shouldn’t have problems when using this tool for long periods of time. If you have been gardening for any length of time, then you are likely very familiar with the hoe. A hoe is an important multi-purpose tool that you will need to have access to. It will allow you to perform many tasks in your garden, and maintaining a garden without one would not be as simple as it would otherwise be. Your hoe can help you to till your gardens, remove weeds, harvest certain crops, and much more. For the best results, you should seek to purchase a hoe that is very durable. You want the hoe to be long enough to reach deep into your garden area without you having to step inside of it. It is also helpful when the hoe is exceptionally durable, allowing you to put pressure on it to move soil around with causing any problems. The hoe being shown here is excellent for these purposes, and it will work well for you. This hoe is tough enough to handle regular work while remaining fairly lightweight. It feels very easy to hold, and this makes it easy to work with it for a long period of time. You won’t get tired while using this hoe too easily, and it always feels like it is up to the task. If you’re in need of a strong hoe that can be used for many purposes, then you will want to consider purchasing this one. Of course, the common shovel is of the utmost importance when it comes to the topic of digging tools. Shovels are used for digging in many different areas. Whether you need to dig into the dirt for gardening purposes, or if you need a shovel for construction, you’re going to be getting very familiar with this tool. It’s the most common tool that anyone will use when needing to dig into the ground. There are many types of shovels, but the traditional shovel is going to be used to dig dirt. Most shovels of this type will have a pointed blade design that makes it easy to dig into the hard ground. You can step on the blade in order to press the shovel into the earth, allowing you to dig deeper. A traditional shovel like this is a staple tool that everyone should know how to use without needing a big explanation. The important thing to remember when choosing a shovel is that you need it to be very sturdy. Consider what you are going to be using the shovel for, and then determine whether or not the shovel is up to the task. You have to think about what you’re going to be lifting with the shovel and how much weight the shovel can carry without having problems. Generally, you should find that most common shovels will be perfectly fine for general gardening and everyday digging on your property. It’s also smart to purchase a shovel that is the right size for you to use it comfortably. Some shovels will be a little longer or shorter than others. Depending on your own height, this may be either good or bad. You want to be able to use the shovel as easily as possible, so taking the time to find a good fit is definitely smart. The shovel that is being shown here has a forty-six-inch long handle. It feels good in your hands and gripping it feels natural overall. If you need to use this shovel for general gardening purposes, then it is going to be perfect. It will work well for any type of digging that you may have to do on your property. A mattock is actually very similar to a pickax and you would be forgiven for mistaking the two. The shape of a mattock is pretty much exactly like what you would think of when envisioning a normal pickaxe. It will feature both an ax blade and either an adze or a pick. Mattocks that have a pick are known as pick mattocks, and the ones with an adze are referred to as cutter mattocks. This tool is used for the purpose of digging and cutting things. It is an agricultural tool that is going to be useful in certain situations. If you need to cut or dig away weeds, then the mattock is going to be a very handy tool to have at the ready. It can also be used to help you dig into the dirt and to plant seeds, so it is a truly versatile tool. People who live in areas with really hard soil like having mattocks around to make things easier. They can be fairly cumbersome to use, and they require a lot of energy to swing. This isn’t an average tool that most people are going to have in their gardens, but it could be very useful depending on your situation. You want to always have access to the best tools for a given job, and, in some cases, the mattock is the right tool to use. Pick out which type of mattock you need before deciding to make a purchase. The mattock being shown here is a pick mattock. It features a fiberglass handle that is easy to hold and always feels very natural. It’s also shock-absorbent, making it a bit easier to swing it without giving into fatigue. A trowel is another important tool that you will want to have access to for your garden area. This is also referred to as a hand shovel or hand spade by some people. Regardless of which name you prefer, it’s just important to know that this is a tool that is going to prove itself useful. When you want to be able to dig small holes for planting in your garden, using a trowel is often going to be the easiest solution. To properly use a trowel, you will want to get down on the ground. Most people use these trowels on their knees and work to complete their gardening tasks. This can be difficult for people with mobility issues, so some may prefer to use the spade that is mentioned above. Even so, the trowel can be easier to use than the spade for certain tasks. You can use a trowel to get right up where you need to be. If you’re trying to dig carefully around other plants in your garden, then a trowel is going to prove to be invaluable. You’ll be able to accomplish what you’re setting out to do and won’t harm any of your other plants in the process. It’s a perfect companion tool for both planting new plants and general garden maintenance. Typically, these trowels will have steel blades and wooden handles. The trowel being shown here has a handle that is made out of oak. It feels very natural to use both with gloves and without them. The durable steel blade is going to work excellently for your purposes, as well, so this is a highly recommended purchase. A post hole digger is going to be essential for some jobs, so you’ll definitely want to own one. If you are planning on putting in a fence on your property, then having one of these to dig the post hole is going to make your life a lot easier. It is possible to do the work with other tools, but this post hole digger is specifically meant for the task. You can dig a post hole very easily with this tool, depending on the type of soil that you’re working with. Particularly hard soil may still prove to be somewhat tough, but it will still be far easier when you have a post hole digger like this. People use these tools for installing many different things. Whether you need to put in a new mailbox, or if you are trying to erect a basketball hoop in your backyard, this is going to come in handy. It’s an important tool to own when you have projects like this to get done. The model being shown here is very high-quality. It is made in a Hercules pattern, and its two-piece steel blades will make quick work of the dirt that you’re trying to remove. It has a fiberglass handle that is going to allow this tool to last you for a long time. Purchasing a durable and nice tool like this will allow you to keep using it well into the future. A planting auger is an interesting tool that you will love owning. It definitely isn’t the first thing that will come to mind when people bring up the topic of digging tools, but it is an important tool to have access to. When you are trying to plant something deep into the ground, having access to a planting auger can make the task a whole lot simpler. 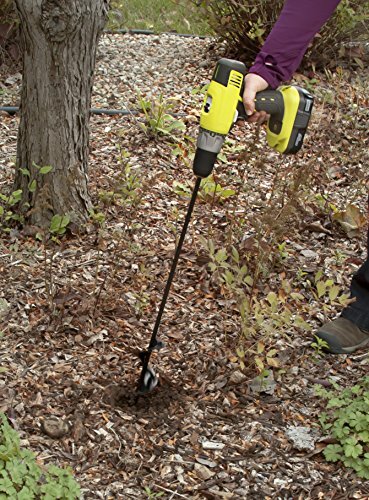 This auger will attach to a drill, and you can then drill into the ground to open up the area. This is the perfect size for planting many different things. You will be able to use this planting auger properly from an upright position and can get it deep into the ground. The auger itself is super durable too, as it is made from steel and can last you for a very long time. Planting your bulbs and annuals will be far easier with this planting auger around. Of course, you’re going to need a standard drill in order to be able to make use of this. It isn’t seen as a completely necessary tool, but it can still be very useful to own one. Digging into the soil with your drill can be far quicker than using a hand shovel, so it’s worth looking into. If you have a lot of bulbs to plant, then you’re going to be relieved to own a tool that can make the job go faster. A knife probably isn’t the tool that you would think of right away when you need to dig something. Knives can actually be quite useful for digging purposes and you will enjoy having a good digging knife around in your garden. A digging knife is even capable of cutting into hard soil and creating holes. You’ll be able to have an easier time with a digging knife than you would a traditional trowel in certain situations. A digging knife is flat enough to be able to help you remove rocks that are embedded in the soil, as well. You will come across situations where you need to remove rocks from your garden area in order to plant something. Having your digging knife at the ready will allow you to pop the rock up without it being too big of a deal. Once you have moved it, you’ll be ready to plant what you’re needing to and move on to the next step. Digging knives like this are useful for more than just gardening purposes, too. You can make good use of this knife while you’re out camping or hiking. It’s a versatile tool that anyone who enjoys the outdoors should keep around. You will find situations in which you will need to dig fairly often, and you also might need to cut something. The knife being shown off here has a great contoured handle that allows you to keep a steady grip. You won’t feel like your hand is about to slip when you’re digging while using this knife. The blade of the knife has a serrated edge and a depth scale, making it simple to see how deep you’re digging. It comes with a carrying case that has a belt loop, as well, making it simple to carry this around with you safely. Having access to the right tools in an emergency situation can be really convenient. For this reason, people have started developing easily portable folding shovels. These shovels are quite compact and can fit in your car without taking up too much space. You can use this shovel to help you out in a pinch if you got your car stuck somehow, or if you need it for any other digging purposes. Shovels are important for many reasons. If you live in an area where it is very snowy, then having access to a compact shovel can really help you out. Sometimes cars will struggle to get traction when there is too much snow, and you may become stuck. Digging into the snow with your shovel to clear a path can mean the difference between staying stuck in the cold and being able to go home. This tool is convenient to take with you when you’re camping, as well. It can help you to make a firepit and to do many other useful tasks. If you want to purchase something that folds down and doesn’t take up much space, then this is going to be a great option. You can keep this right in your trunk without it ever really being a bother. This particular folding shovel has several other functions, as well. It includes a compass, a saw blade, and even a screwdriver. You’ll be able to get yourself out of many situations by having a convenient tool like this around. It’s a good survivalist tool that will help you to dig and perform many other tasks. It’s well worth the price and should be one of the most convenient tools that you own. Power tillers are also digging tools that are used to till garden areas. Rather than digging deep into the dirt, they dig just into the surface and turn the dirt over for the purpose of aeration. This is essentially the power version of the gardening fork that was mentioned above. If you want to be able to till your garden areas very quickly, then buying a power tiller is going to make the job go much easier. There are many different types of power tillers that you can purchase, as well. You will find both electric models and gas-powered models on the market. The gas-powered models are generally more powerful, but they are also very noisy. They also cause some measure of pollution, which many people want to steer away from whenever possible. Electric power tillers are the best option for many people. The model being shown here is a corded model that will work well for your purposes. It can aerate your garden quickly and feels really simple to use overall. It has six steel tines that are capable of turning over your soil at a high speed, making it a perfect option for tilling the garden in a timely fashion. You can maneuver this power tiller pretty simply, as well. It features rear wheels that make it easy to move this tiller around wherever you need it to go. Tilling the garden will be a simple task when you have access to a tool like this. It is more expensive than simply buying a gardening fork, though, so you may want to consider how much you actually need this before moving forward.